came in the service was already going on, although the sign outside clearly said “Divine Liturgy, 9:30.” You felt embarrassed to apparently be late, but these people are even later, and they’re walking all around inside the church. What’s going on here? begin to recognize it as an expression of a faith that is not merely formal but very personal. Of course, there is still no good excuse for showing up after 9:30, but punctuality is unfortunately one of the few virtues many Orthodox lack. already-existing church buildings, will have well-used pews. In any case, if youfind the amount of standing too challenging you’re welcome to take a seat. No one minds or probably even notices. Long-term standing gets easier with practice. venerate the cross or an icon, and on many other occasions in the course of the Liturgy. But people aren’t expected to do everything the same way. Some people cross themselves three times in a row, and some finish by sweeping their right hand to the floor. 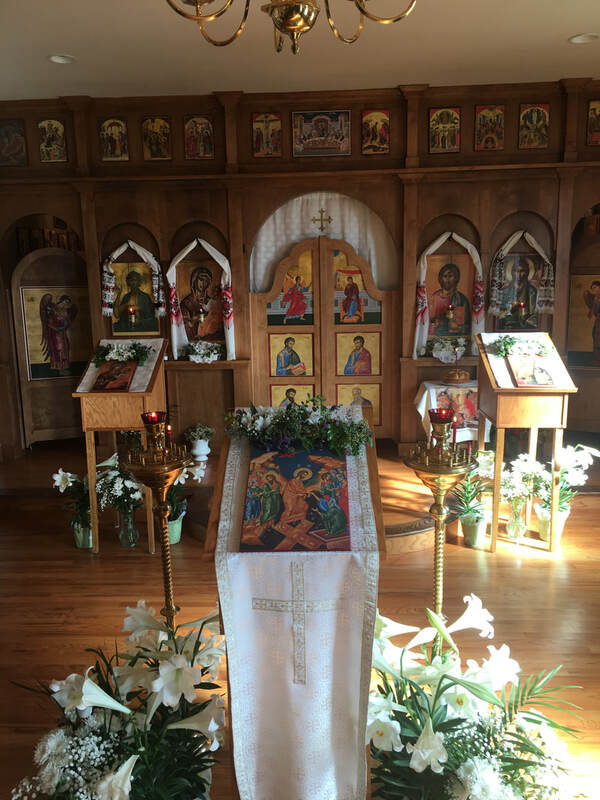 On first entering a church people may come up to an icon, make a “metania”—crossing themselves and bowing with right hand to the floor—twice, then kiss the icon, then make one more metania. This becomes familiar with time, but at first it can seem like secret-handshake stuff that you are sure to get wrong. Don’t worry, you don’t have to follow suit. beginner’s imprecise arrangement of fingers won’t get you denounced as a heretic. make a prostration we kneel, place our hands on the floor and touch our foreheads down between our hands. It’s just like those photos of middle-eastern worship, which look to Westerners like a sea of behinds. At first prostration feels embarrassing, but no one else is embarrassed, so after a while it feels OK. Ladies will learn that full skirts are best for prostrations, as flat shoes are best for standing. some kiss the chalice, some kiss the edge of the priest’s vestment as he passes by, the acolytes kiss his hand when they give him the censer, and we all line up to kiss the cross at the end of the service. When we talk about “venerating” something we usually mean crossing ourselves and kissing it. you and try not to bump your nose. Orthodox worshipping community. There’s nothing exclusive about this; everyone is invited to make this commitment to the Orthodox Church. But the Eucharist is the Church’s treasure, and it is reserved for those who have united themselves with the Church. An analogy could be to reserving marital relations until after the wedding. believe it is truly the Body and Blood of Christ. We ourselves do not receive communion unless we are making regular confession of our sins to a priest and are at peace with other communicants. We fast from all food and drink—yes, even a morning cup of coffee—from midnight the night before communion. expected to be making regular, private confession to their priest. organs. Usually a small choir leads the people in a cappella harmony, with the level of congregational response varying from parish to parish. The style of music varies as well, from very Oriental-sounding solo chant in an Arabic church to more Western-sounding four-part harmony in a Russian church, with lots of variation in between. to about two and a half, and later (around 400 A.D.) the Liturgy of St. John Chrysostom further reduced it to about one and a half. Most Sundays we use the St. John Chrysostom liturgy, although for some services (e.g., Sundays in Lent, Christmas Eve) we use the longer Liturgy of St. Basil. Mary and other saints as well. They’re not dead, after all, just departed to the other side. Icons surround us to remind us of all the saints who are joining us invisibly in worship. adorned with icons. Some versions shield the altar from view, except when the central doors stand open. The basic set-up of two large icons creates, if you use your imagination, three doors. The central one, in front of the altar itself, is called the “Holy Doors” or “Royal Doors,” because there the King of Glory comes out to the congregation in the Eucharist. Only the priest anddeacons, who bear the Eucharist, use the Holy Doors. epistle, and serve on the parish council. Antiochian, Serbian, and on and on. Is Orthodoxy really so tribal? Do these divisions represent theological squabbles and schisms? Antiochian Archdiocese (Arabic roots). The liturgy is substantially the same in all, though there may be variation in language used and type of music.